“Squanto's Journey” is the story of how Squanto welcomed the newcomers and taught them to survive in the rugged land they called Plymouth. Learn about how without the help of this Native American, the first Thanksgiving celebration would never have been possible. 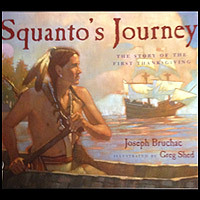 Hurry — enter to win your copy of “Squanto's Journey” today!